When 4 to 16 Characters popped up on my reading list, I was really excited to see a book written outside the normal prose form. I think something that breaks the status quo is a huge bonus for young adult books, as students are drawn to the unique and unusual. Lately, I’ve seen several narratives written through a long series of poems, but I like that Hourihan went a different direction- writing the whole book through online interactions and posting. The tale is told through Jane’s private digital journal entries, her posting on fan-fiction web pages, her IMs with friends (and eventually her therapist) and her email exchanges at her high school. Jane’s real life is more than a bit of a mess. Her mother died a year before the book begins and her father has since spiraled into depression and alcoholism, leaving her to fend for herself, a job she isn’t emotionally equipped to undertake. She already attends a special high school, Spectrum, for students with social and learning disabilities, but things quickly degenerate as she feels trapped at school and at home. To relieve the pain of both places, she enters a new world- the digital one. After creating a series of online personalities, Jane retreats to internet forums and fan fiction sites, where she can choose her persona each day. Soon, Jane’s days revolve around these online interactions, her real-world ones breaking down even further. What initially intrigued me about the book, the narrative form, is what eventually lead me to like the book less and less and I continued to read. The online chats and fanfic postings were initially entertaining and a fun change of pace, but they quickly became frustrating to read and a bit tedious. 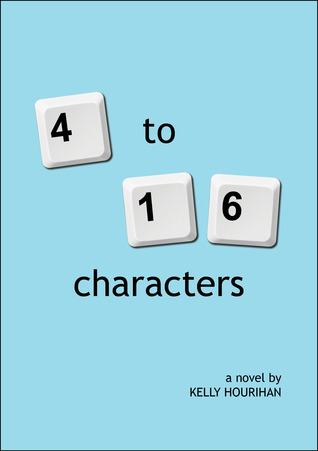 At times, reading 4 to 16 Characters was like trying to read a screenplay. (At times, I literally *was* reading a screenplay!) I didn’t enjoy following character conversations that interrupted each other, jumped from user to user and were filled with occasionally hard to decipher abbreviations. There is where my age might hamper my love of Hourihan’s tale. The things that bothered me throughout the book may very well not dissuade today’s teenager from reading it. Today’s high school students spend a huge amount of time communicating in these very formats, so what I found a bit bulky and cumbersome may just be second nature to a younger reader.